Icelandic Social Affairs Minister Johanna Sigurdardottir would be the world's first openly gay leader if she becomes Prime Minister of Iceland, as is widely expected. Although Per-Kristian Foss served as acting Prime Minister in Norway very briefly in 2002, this represents the first time that a gay leader would assume the reins of a modern state. Sigurdardottir would also become the first female Prime Minister in Iceland's history. 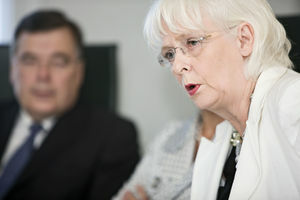 As has been extensively reported, Iceland is in the midst of an economic and political crisis that has brought down the ruling coalition of Geir Haarde. Although elections have been called for in May, Mr. Haarde has announced that he will step down because of the discovery of a malignant tumor on his esophagus earlier this week. This small North Atlantic nation was the first to elect a female head of state when Vigdis Finnbogadottir became its 4th president in 1980. Although that event was widely publicized at the time, Ms. Sigurdardottir's appointment has been met with general apathy both inside and outside the country. I guess I still have the attitude of most Icelanders when it comes to matters of sexual issues, because I failed to pick up on the newsworthiness of Sigurdardottir's sexual orientation. "Oh, vow," said an American friend of mine, "that's really something! First openly gay world leader!" Huh? Why, who cares? Even after living in America all these years, where hounding politicians into surrealistic hell about their private lives is the norm, it didn't really ring bells for me. "I don't see what her sexual orientation has to do with anything," my mother told me yesterday. "It's no one's business but her own." My usually taciturn father agreed strongly. "She is the most trusted and respected politician in the country," he said, "and she is simply the best person available for the job. Ja, that is just twisted thinking," he replied when I told him that her sexual orientation would probably be more newsworthy in America than anything else surrounding her appointment. Sigurdardottir, 66, has a long background in Icelandic liberal politics. She has been a member of Althingi (the Parliament) since 1978, was Minister of Social Affairs in 1987 until 1994, and again in 2007. She is one of the most popular politicians in the country; in a recent Gallup poll 73 percent of respondents said they were satisfied with her work. She is also the only minister whose popularity had increased compared to a similar poll undertaken in December 2007. Sigurdardottir is the mother of two grown sons and is married to Icelandic writer and playwright Jonina Leosdottir. She is often described by many of her countrymen as the only politician who really cares about the "little guy." She has devoted her career to fighting for the welfare and equality of minority groups - women, the elderly, the poor, disabled, and immigrants. She holds no fancy foreign diplomas - she has a Commercial degree from the Commercial College of Iceland - nor extensive family or wealth connections like many Icelandic politicians but has diligently worked her way up the political ladder through hard work and determination. Her professional career includes working in the 60s and 70s as a flight attendant for Icelandair (the old Loftleidir Airlines) and an office worker in Reykjavik. Germans agonized over whether they were ready for its first gay leader in 2006 after that country's leading homosexual politician, Klaus Wowereit, 55, who proudly hugged his long-standing boyfriend in front of television cameras, won a second term as mayor of Berlin. The French grappled with the issue in 2001 when Bertrand Delanoe, 59, one of the country's first openly gay politicians became mayor of Paris. Last year, the popular Delanoe declared his candidacy for leadership of France's Socialist party and has been said to be considering running for president in 2012. "No one has ever talked about Johanna (Icelanders always use first names) as a gay person," an Icelandic friend and a prominent journalist told me this morning. 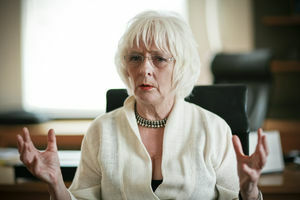 "She's not hiding it either, the name of her spouse is on her Parliament and Ministry web pages, it's just that nobody cares about it, any more than people cared in 1980, when Vigdis Finnbogadottir ran for president, that she was a woman and a single mother to boot.